For one dog living in the high-kill, Miami Dade animal services, the struggle to find a home is all too real. 12 years old male black Chihuahua is a senior adorable pup, who is often passed up for other dogs. A shelter volunteer who wished to remain anonymous for this story says that the only reason she could think of as to why this pup has not been adopted has to do with one thing and one thing only: the color of his coat. 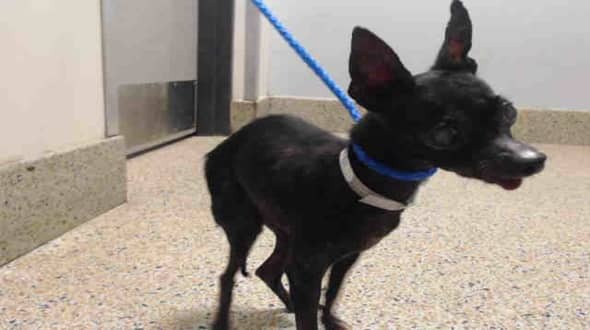 CHILLI (A1961458) I am a female black Chihuahua - Smooth Coated. The shelter staff think I am about 12 years old. It was hard to find him but once we realized how small he was we looked under the bed. He is so precious and scared and he needs help now. Please SHARE for his life, he's SO special and a FOSTER or ADOPTER would save him. SpeakUp, let’s change the course you this young pup’s life. This precious pup deserves the love that he has never received in his life, and we can help make that happen. 4 Responses to "Sadly, no one wants to adopt this frightened 'ugly' black chihuahua"
You said he was 12, then you refer to him as young. So, which IS it? I'll gladly adopt him! Where is he now?